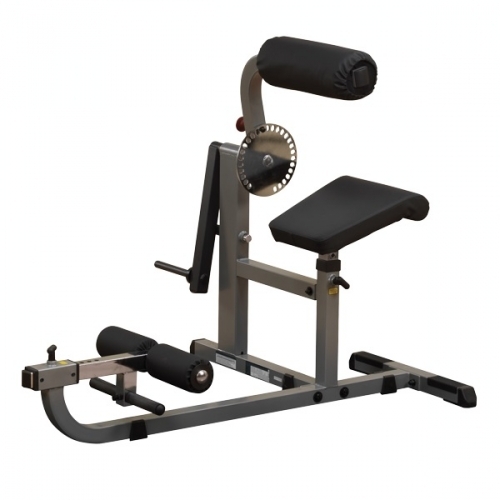 This Body Solid Cam Series Ab Back machine GCAB360 is a unique dual-function machine allows you to exercise two major muscle groups (the stomach and back) for one great low price. The innovative plate-load design is based on health club single station machines. We even incorporated 2” x 4” mainframe steel from our commercial grade line of equipment for institutional quality. The full-range cam design has an easy-to-use pop pin that allows an additional 26 adjustments to increase and control your range-of-motion. Break-through technology lets you tighten abdominal muscles, strengthen your lower back and increase flexibility. Weight plate post is 1" dia. Shown with optional #OAS14 - Olympic Adapter Sleeve. The Body Solid Cam Series Ab Back machine GCAB360 is designed to provide an intense workout while eliminating strain, the Body Solid Cam Series Ab Back machine GCAB360 is hard to beat. Easy and convenient step-in design makes getting started a breeze. The Body Solid Cam Series Ab Back machine GCAB360 thick, comfortable DuraFirm™ pads reduce fatigue and discomfort allowing you keep working out. Rock solid support and stability is delivered via heavy-gauge steel frames with all-4-side welded construction. The Body Solid Cam Series Ab Back machine GCAB360 is specially designed to focus on your Abs and Lower back. The Ab crunch is one of the best ways to work your abs in a safe and efficient manner, and the back extension is a great way to strengthen your lower back. Optional Olympic Adapter Sleeve, weight plates and collar. Call 1-800-875-9145 to chat with one of our fitness advisors with any questions you may have about the Body Solid Cam Series Ab Back machine GCAB360. Don't wait order your Body Solid Cam Series Ab Back machine GCAB360 from FitnessZone.com today! The Body Solid Cam Series Ab Back machine GCAB360 is a unique dual-function machine that allows you to exercise two major muscle groups (the stomach and back) for one great low price. The innovative plate-load design is based on health club single station machines. We even incorporated 2” x 4” mainframe steel from our commercial grade line of equipment for institutional quality. The full-range cam design on the Body Solid Cam Series Ab Back machine GCAB360 has an easy-to-use pop pin that allows an additional 26 adjustments to increase and control your range-of-motion. Break-through technology lets you tighten abdominal muscles, strengthen your lower back and increase flexibility. Weight plate post is 1" dia. Shown with optional #OAS14 - Olympic Adapter Sleeve. Order your Body Solid Cam Series Ab Back Machine from FitnessZone.com today!